Our Division is located in the North Carolina Cancer Center. Our clinic, which is over 10,000 square feet, has six full field digital mammography units, four dedicated breast ultrasound units which are utilized in the work-up of breast lesions and for image guided procedures, a stereotactic machine, patient consult and recovery rooms, and a patient education room. 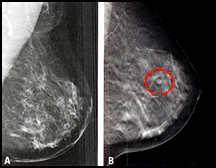 There is also specific new space where research on new breast imaging modalities can be undertaken. In this way, clinical trials on the latest breast imaging technologies will always be available to UNC patients. Participating in groundbreaking research studies to seek improvements in Breast Imaging. To make an appointment with UNC Health Care Mammography, please call 984-974-8762.